I've seen a lot of boring powder rooms in my day: builder white walls, white fixtures, not a picture or a rug in sight. I like people to be pleasantly surprised when they open a powder room door. You can achieve this by a shock of color or by your choice of wallcovering. 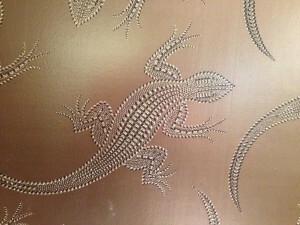 While at the design center recently I came upon a wallcovering and thought “Now, how cool is that?” It was a wall of Komodo dragons. They were jewel encrusted and looked very three-dimensional. What surprised me as I walked up to touch the wallcovering that it was perfectly flat. It was a holographic foil. My next thought was it would be great in a powder room. It comes in several colors: red, black, green, silver, gray, and gold. Pair it with a beautifully framed and matted picture of a jungle scene where the dragon might live. Paint the ceiling, inside of the door and trim the same background color. Add a Persian designed rug. When a guest opens the door to your powder room give them a surprise: a trip to the Holodeck!